During the last week of September, the next phase of the project “Women of Minya Day by Day” took place. 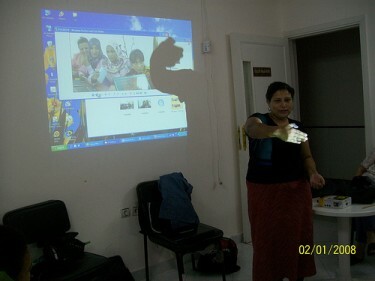 A three-day training was given to a group of women from Dawadia village in Upper Egypt. Sessions varied between supplying women with the foundation to build upon the rest of the training. Participating women were given the basics of photography, video shooting, editing and using photos on blogs, also a quick introduction to social networking websites like Twitter and Facebook. I want to tell you today about an Egyptian female peasant, who is living in Dawadia village. Our women are just like other females living in other villages, who want to live in peace with her husband and children. She is the first person to wake up in the house. She washes her face and thanks God for her children's and husband's health, then she looks after the work she has to do – which never ends! الفلاحة المصرية ميخلصش دورها عند التنظيف وتسخين المية للزوجها ، دة يدوبك بداية النهار ، احنا كدة ليسة الساعة ستة ونصف او سابعة الصبح، الست دي بتطلع برة البيت تسعى على رزقها بردو، اغلب الستات في الدوادية ارزقية ، ميعرفوش التوظيف ، كلهم بيشتغل في تسمين الطيور والبهايم خبيز العيش الرحى او الشمسي، ويطلعوا في ايام معينة من اخر الاسبوع يبيعوا الطير اللى ربوه ، ومش كل اسبوع هيقدروا يبيعوا وزة ولا بطة، في اغلب المرات هيطلعوا يسرحوا بشوية بمية او عدان ملوخية ، والخضار رزقة فليل لكن بيمشي واحسن من مافيش، الستات الارزقيات لازم يعرفوا يجيبوا فلوس كل مرة بيخرجوا فيها برة البيت. The work of Egyptian female peasant doesn't end at cleaning the house, its only the start of the day. It only happens between dawn till seven o'clock. After that, she works outside the house. Most of women from Dawadia village work as orzqyat (women who are earning their living day by day), and not employed. They all work in raising poultry or cows or baking bread. They go in certain days and sell what they have been raising. Sometimes they don't sell, so they try anything else. To sell some oak or other vegetables. Orzqyat women should make money every time they go outside the house. العيال كمان لهم نصيب من العمل خارج المنزل ، في اسر ممكن تسرح العيال بأكياس فشار يروحوا يبيعوها على الطريق، او يسرحوا مع امهم في بيع كام كيلو خضار ولا حتة جبنة او كام بيضة جبوهم الصبح من تحت الفراغ، لكن اوحش حاجة ان فيه عيال ممكن تطلع الجبل تقطع الحجر، دول ممكن يرجعوا وممكن ميرجعوش ومشاكلهم الصحية كتيرة ، صدرهم مع الوقت بيتعب ، ويوميتهم محدودة في الاخر. الغريب ان ست الدار قليل ما حد من البيت بيشكر تعبها ، ست شقيانه جوة البيت وبراه واول واحدة تصحى واخر واحدة تنام واخر واحدة ممكن تأكل واخر واحدة ممكن نسأل على صحتها، الست في الريف بتشتغل كتير وبتتحمل مسؤليات كبيرة لو قصرت فيها تتلام وممكن تضرب وتنهان من زوجها من حماتها . اهل الزوج دول كمان موال تاني عايزة كتابة مرة كمان!! Children also have a share in working outside the house. They can sell popcorn bags on the road, or with their mothers to sell few kilos of vegetables or cheese or few eggs. But the most dreadful thing that some children may go to the mountain to work in quarries. These children may return back home and others may not. And if they did, they return with serious health problems in their lungs, while their daily salary is very limited. The strangest thing that rarely anyone thanks the woman of the house for her effort. 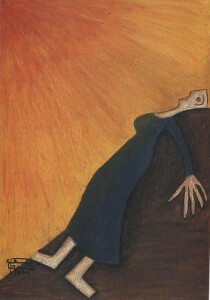 She is tired outside and inside; the first one to wake up and the last to sleep, and the last to eat, and the last one to be asked about her health. The women living in villages work a lot, and handle a lot of responsibilities, and if she ever couldn't do it all well, she would be blamed or beaten or humiliated by her husband or mother-in-law. تخيلوا بعد ما تقعد في دارك سينين طويلة، تشهد حيطانه على فرحك وحزنك على حظل الكتير وحظك القليل، تيجي الحكومة تطرودك بره، تخيلوا دة حصل في الدوادية !!! الست سعاد ست اميرة ارملة وام لاربع بنات، بعد وفاة زوجها غدر عليها اهله ، رفضوا تكون هي وعيالها في بيت العيلة، واكلوا ورثوا وحقه في امه وابوه، الست سعاد مستسلمتش ، ست جادة وتد بصحيح ، راحت وسكنت من زمن في بيت وحديها هي وعيالها ، وقررت تشتغل آمال اية؟؟؟. Imagine after staying too long in your house, and having memories on every single corner and wall, then the government comes to kick you out! Can you imagine that this happens in Dawadia village? Saud is a widow with four girls. After her husband passed away, his family refused to let her stay in the family's house. They took his inheritance, but Saud didn't give up. She worked, and decided to live in another house, with her children, alone. Do you know that she decided to work? She worked as a truck driver, to carry workers from village to the mountain. As if this woman wanted to tell people that I am strong and I can do what not any other woman could do, or what is only considered men's work. The story continues speaking about another more tragic problems concerning the ownership of the land they are living on. The government decided that Saud cannot live in her new house. Yet, the story ends with some hope of giving a voice to Saud, through the project, to tell us more about her work, and how she is raising her four children. Portrait by Safa Samir during a previous project implemented by New Women Foundation called “Creative women in Shadow”, also in Dawadia village. أنا نفسي اكمل تعلمي زي بنات المدينة، لكن بيقولي لازم تطلعي من التعليم وكفاية عليكي تقري وتكتبي لان التعليم بضر مش بيفيد!!! I hope to complete my education, just like city girls; but they told me enough, I should get out of school because education isn't useful for women. One last post narrated by one of the participants, she talked about how difficult it is for them to even have “bread” at times. But of course that is not everything, more updates from the project's first workshop to come soon. You can see more photos of the workshops at the Women of Minya Day by Day Flickr account, where they also share some of the art created by another project that the New Women Foundation implemented in the village. I hope that muslim women will fight for women rights , and they will win!! !